At Five Lions Heating & Cooling we specialize in custom made fireplaces to suit the décor of your home. We offer a wide collection of Fireplaces, including the high quality and crafted Kingsman, Napoleon, Monessen brands. When you add a gas Fireplace to your home, you can relax and be guaranteed that you will enjoy comfort with consistent performance for many years. When you invest in a Gas Fireplace they add extra value to your home, they are adaptable and can be placed almost anywhere in your home! Now with these modern Fireplaces, Five Lions Heating & Cooling can ensure that you’re receiving the perfect comfort level for any occasion and season. Gas Fireplaces are so convenient today, they come with convenient remotes that you can fine tune the flame and heat output. This offers a wide range of comfortable heat settings. A Gas Fireplace is extremely safe and effective with almost no discharge and is very environmentally friendly. A Gas Fireplace removes all the stresses of having a wood Fireplace; it is easy and convenient where removal of firewood, ashes and chimneys is unnecessary. Avoid the hassle of gathering and stacking wood to burn your wood Fireplace. In addition a Gas Fireplace is a better choice for your home. It has a more realistic quality than an electric Fireplace and a Gas Fireplace makes heating reliable during power outages. Fireplaces have always been one of the top amenities that homeowners look for in a home. Gas Fireplaces has gained their popularity due to convenience, style and much more. They are a relaxing ambiance and a beautiful flair to any room in the house. During seasonal times like Christmas, a Gas Fireplace is a great place to have family gatherings and a somewhere to hang stockings on Christmas Eve. At Five Lions Heating & Cooling our team of professionals specialize in Gas Fireplaces in the east end of Toronto: Scarborough, Pickering, Ajax, Whitby and Markham. We travel further east as well. 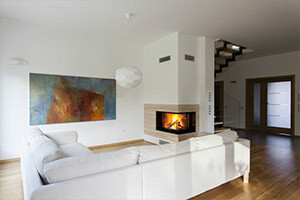 We offer many hot choices when it comes to gas Fireplaces for homeowners. If you’re thinking about replacing an old Fireplace, or investing in a new one call Five Lions Heating & Cooling today and book an appointment.